AUSTIN, TX– Strong home buying activity throughout the summer led to double-digit home sales growth in July, according to the July 2018 Central Texas Housing Market Report released today by the Austin Board of REALTORS®. The five-county Metropolitan Statistical Area (MSA) experienced the highest volume of home sales since July 2011, and the highest median home price on record for any month. In the Austin-Round Rock MSA, July single-family home sales increased 8.8 percent year over year to 3,103 sales, while sales dollar volume increased 13.7 percent to $1,254,255,680. The median home price increased six percent year over year to a record-breaking $320,000. For the second month in a row, pending sales growth experienced strong gains across the MSA, increasing 8.3 percent year over year to 3,201 pending sales in June and 10.8 percent to 3,065 pending sales in July. However, the number of homes on the market fell during the same time frame. In July, active listings for the five-county MSA fell 2.7 percent to 7,522 listings and new listings decreased 1.2 percent to 3,738 listings. “Housing construction is at an all-time high in Central Texas, but the pace of new housing stock entering the market can’t justify last month’s jump in sales growth on its own. These gains in home sales activity are being driven by pure demand,” Vaike O’Grady, Austin regional director for Metrostudy, said. 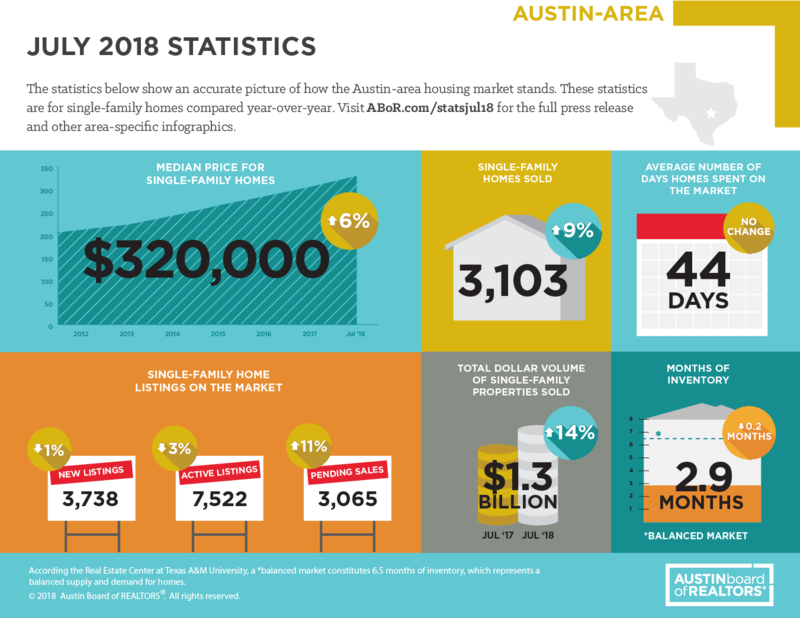 In the city of Austin, the July median price for a single-family home increased six percent year over year to $390,000. During the same time frame, new listings decreased seven percent to 1,066 listings; active listings decreased 13.8 percent to 1,675 listings; and pending sales rose 11.6 percent to 904 sales. Monthly housing inventory decreased 0.4 months to 2.1 months, well below the Real Estate Center at Texas A&M University’s benchmark of 6.0 months as a balanced housing market. In Travis County, July single-family home sales increased 15.7 percent year over year to 1,594 home sales, while sales dollar volume increased 17.5 percent to $769,540,765. The median price for single-family homes grew 4.5 percent to $375,000. During the same period, new listings remained relatively flat, with a 0.3 percent increase to 1,854 listings. Active listings decreased 7.8 percent to 3,543 listings, while pending sales jumped 12.3 percent to 1,503 sales. Monthly housing inventory decreased 0.3 months year over year to 2.8 months of inventory. In Williamson County, July single-family home sales increased 5.7 percent year over year to 1,054 home sales, while sales dollar volume increased 7.7 percent to $326,159,581. During the same period, the median price for single-family homes increased 2.1 percent to $280,734. New listings decreased 6.5 percent to 1,204 listings; active listings decreased 2.1 percent to 2,497 listings; and pending sales rose 10.6 percent to 1,055 pending sales. Housing inventory decreased 0.2 months year over year to 2.8 months of inventory. In July 2018, Hays County single-family home sales rose 2.7 percent to 347 sales, while sales dollar volume slightly decreased, with a 0.6 percent decrease to $113,218,199. Median price decreased three percent year over year to $265,000. During the same time frame, new listings remained relatively flat, with a 0.2 percent increase to 478 listings; active listings increased 5.9 percent to 1,045 listings; and pending sales rose 6.1 percent to 366 sales. Housing inventory increased 0.1 months to 3.6 months of inventory. For more information and to download the July 2018 Central Texas Housing Market Report, visit www.abor.com/statsjul18.